Nature’s Whole B has set the nutritional stand for natural, complex B Vitamin supplements. B Vitamins are essential for brain development, nerve function, hormone production/regulation, stress reduction and weight management. This product contains (8) water soluble vitamins which are needed to convert fat, carbohydrates and protein into energy, meaning B Vitamins play a significant role in weight loss. If you are ready to begin your path to a healthier life order Nature’s Whole B today! 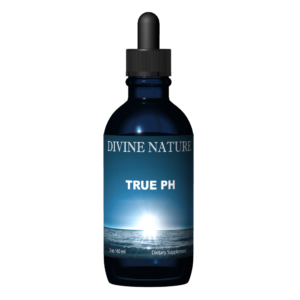 Nature’s Whole B is simply the highest form of a B Vitamin complex you can find. It has been taught for years that B vitamins are the way to have healthy skin, hair. The benefits hardly stop there. B vitamins are very important for nerve function and are proven to help reduce the effects of stress and aging in addition to regulating hormone production. In this product you have eight water-soluble vitamins that are needed to convert fat, carbohydrates and protein to energy. B vitamins are essential in weight loss and as a way to maintain vitality. They also aid in the function of the cardiovascular, immune and nervous system, the synthesis of red blood cells and DNA, promote growth and tissue repair, and are important for healthy skin and hair. This group includes thiamin (B1), riboflavin (B2), niacin (B3), pantothenic acid (B5), biotin (B7), pyridoxine (B6), folic acid (B9) and cobalamin (B12). Research shows that few people consume adequate amounts of vitamin B. Vegetarians are particularly prone to vitamin B deficiencies, as are dieters and people who consume junk foods, high-fat and high-sugar diets. What is important to understand is that vitamin B is a complex of (8) water-soluble vitamins and should rarely be taken separately in high dosages for an extended period of time. Notwithstanding, most vitamin supplements on the market do not contain a balance of all eight B vitamins as a whole food complex. Instead, they provide large excess amounts of some B vitamins and small amounts of others. Nature’s Whole B on the other hand has set a new standard for B Vitamin supplements. 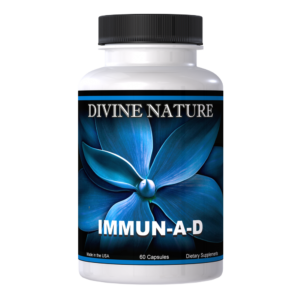 Divine Nature utilizes nutritional yeast in a vegan friendly capsule designed to provide a rich source of the entire B vitamin complex. No longer must you settle for synthetic/chemical B Vitamins and gone are the days of buying jars of flakes or powders. 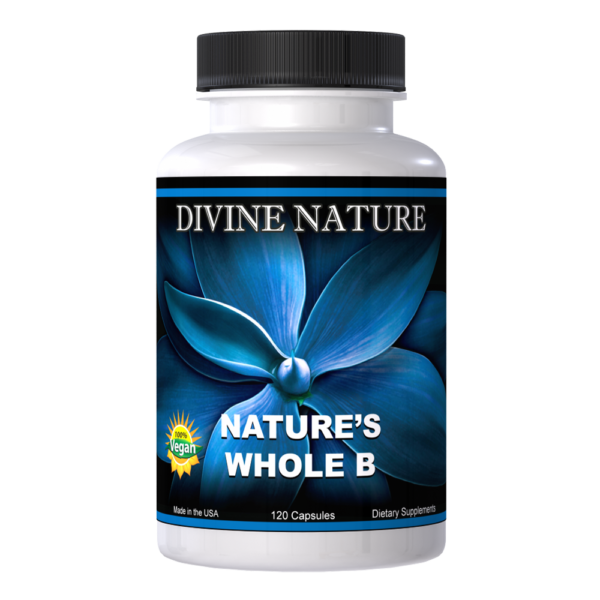 Nature’s Whole B provides you with a natural, powerful and convenient capsule full of the B Vitamins your body needs. Nature’s Whole B is for vegetarians, athletes, or anyone who needs a rich, natural source of the complete B vitamin complex from a good, vegan protein source. Along with providing B vitamins and protein in the most absorbable and effective form, this nutritional yeast is a good source of other vitamins and minerals. 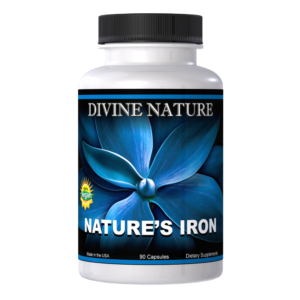 Supplementing with Nature’s Whole B also supplies significant amounts of iron, choline and many other nutrients. Naturally low in calories, this nutritional yeast adds dietary fiber and can be used as a dairy replacement in the vegetarian diet. 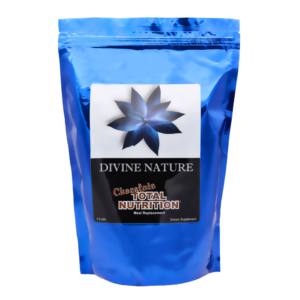 Nature’s Whole B can be taken in its capsule form or opened and the powder supplement can be added to any food or mixed into water or juice in order to supply the vitamin B needed on a daily basis. Recommended Dosage: Take 2 capsules twice daily with meals or utilize as a supplement to food.